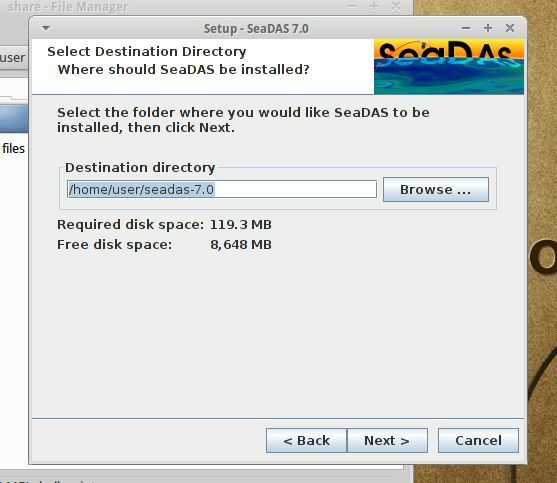 As the title suggests, this post is about running SeaDAS 7.0 on Windows and the reason behind the very existence of this blog. You may do so easily, if your objective is to visualize data. However, if you want to do some data processing, and this is probably the case for most of SeaDAS users, you will have to take some extra steps. I will try to explain how you can get the job done if you are running Windows 7. 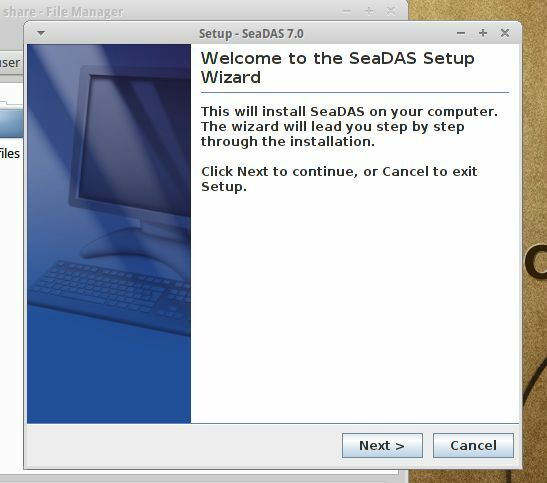 I will describe the solution I am using to install SeaDAS on several computers, with success, but if you choose to follow this set of instructions, do so at your own risk. If you find a problem or if you have a better way of doing something, please contact me, and I will post your ideas/comments. The entire process is rather simple and it won't take long to complete. Most of the time is actually spent downloading the necessary software (SeaDAS and SeaDAS processing files included). Notice, that everything used in this tutorial is free. 1. Get Everything you need! d) If you don't have a program that can extract the compressed OSGeo, I recommend 7-Zip: Found here. 2. Let the installations begin. Now that you have almost everything that is necessary, install VirtualBox. The process is mostly self-explanatory and you shouldn't find it difficult. Make sure you unzip the OSGeo virtual appliance. You also need to create a folder where you will store the files you want to use on both Windows and the Virtual Machine (where SeaDAS will run). I use "C:/shared" to make it simpler to write down the paths when asked by the Virtual Machine. 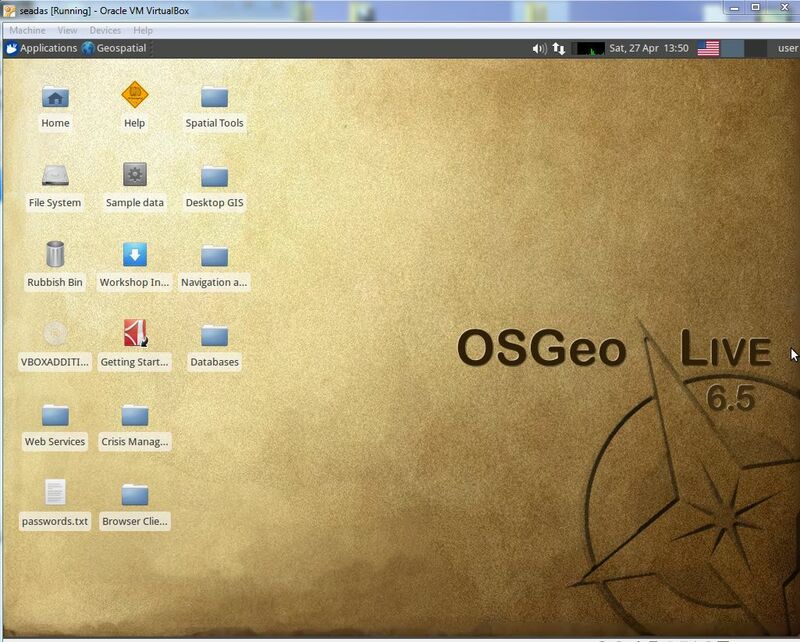 Once VirtualBox is installed, you will be able to create your first Virtual Machine, using the OSGeo Live appliance. On the VirtualBox Manager, select 'New'. Fig. 01. Creating a New VM. 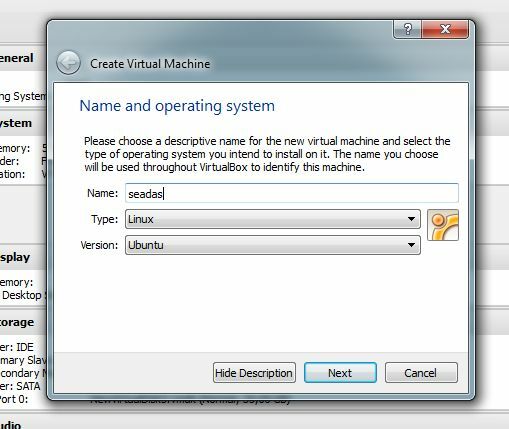 You must now insert the name of your VM and the Type/Version. I am using Linux/Ubuntu. The next screen will ask you to select the amount of memory (RAM) that will be allocated to the VM. By default, VirtualBox sets it to 512 MB, for now, you may keep it unchanged. By now if you didn't unzip the OSGeo Live file, please do so. You will need it now. 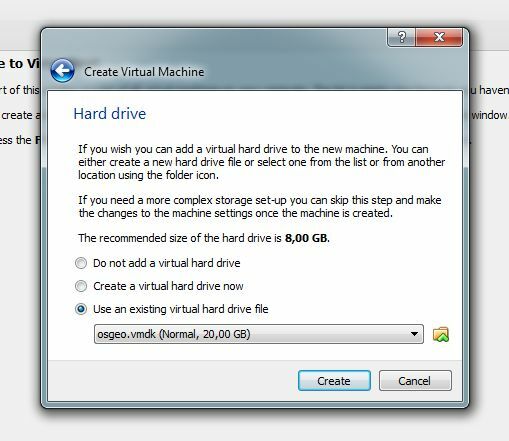 Now that you have your OSGeo Live .vmdk file, select 'Use an existing virtual hard drive' as depicted in figure 2. Select the OSGeo Live vmdk. Fig. 02. 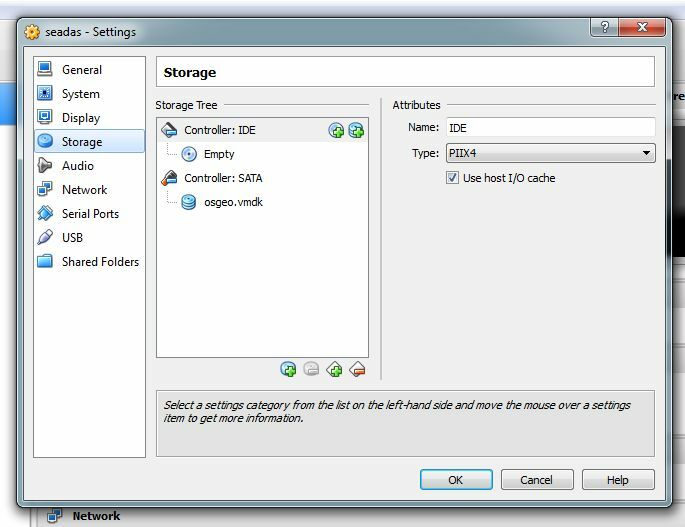 Select the existing OSGeo Live vmdk as the hard disk of your VM. Click 'Create'. You can now check the settings of your newly created Virtual Machine. Now, click 'Settings' (Upper left corner) and select the option 'storage'. Fig. 03. Selecting the storage settings. Now, you can go back to settings, but this time select the option 'Shared Folders'. this option gives you the chance to select a folder that will be shared between your host OS (in my case Windows 7) and the VM. I usually create a folder named 'share' (C:/shared"), but you can choose other location and name. But you will need to use this information later on, so please keep that in mind. You are now ready to power on your VM for the first time. Let's give it a go. Click 'Start'. Read the messages that pop up while the VM is fired up. Fig. 04. Your VM will look somewhat like this. Well, you are a step closer to get SeaDAS up and running, but you still have to instal a few more things. If you are tired, go grab a coffee and relax for a while. The first thing you need to do is to install GuestAdditions. Why? Because we need this to use our shared folder, which will come in very handy later on. Remember you asociated the iso file in the storage tab? You now need to mount it and run it. Some users reported difficulties in this step and so I will give you a simple approach to install this component. Look for the VBGuestAdditions disk in the desktop and right-click to 'Mount' it ('Mount the Volume'). Fig. 05. 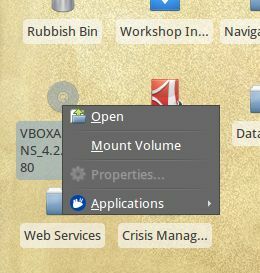 Right-click and select 'Mount Volume'. Now, click on the mounted disk and right-click over 'autorun.sh'. Select the option 'Execute'. Fig. 06. The Guest Additions Folder. Fig. 07. Executing the 'autorun' to install the Guest Additions. You will be asked for the password, because you need to have privileges to install the software. You can find a text file in the desktop named 'passwords'txt'. The password is 'user'. You can now mount your shared folder. To do so, navigate to the 'User' folder (just click 'Home' in the desktop) and create a new folder, named 'share'. Now right-click inside the 'User' folder and choose 'Open Terminal Here'. It may ask you for the password, once again type 'user'. Done. You can now use the shared folder. If you check the SeaDAS requirements page, you will notice you need to install a few components for it to run properly and process data. These include Bash, cURL and git. We will install them now, it's really easy. Open a terminal on the desktop. And there you, you now have Bash installed! 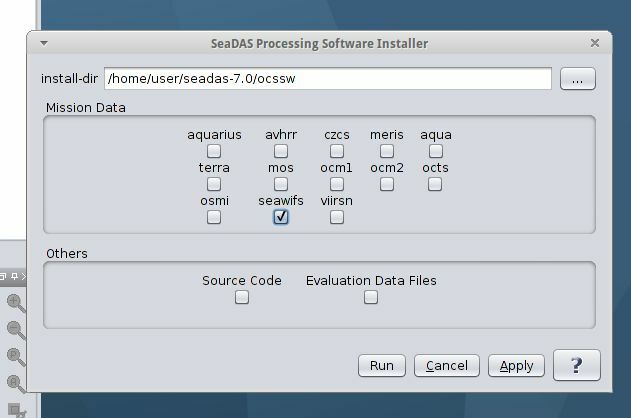 We are now ready to install SeaDAS 7.0. To do so, move the installation file (seadas_7.0_linux32_installer.sh) downloaded from NASA's OBPG website to the shared folder.As you will see in a minute, it is very simple. 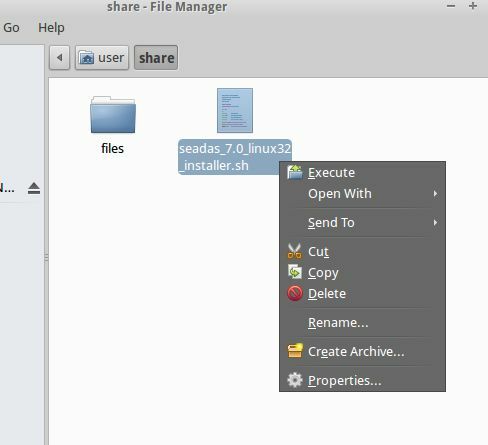 Within the VM, navigate to the shared folder, right-click on the SeaDAS installation file and execute it. Follow the steps and there you have it! Fig. 08. 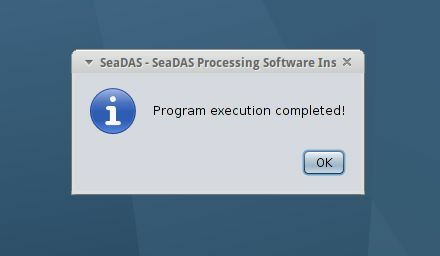 Executing the SeaDAS installation file. Fig. 09. The SeaDAS installation wizard. Fig. 10. 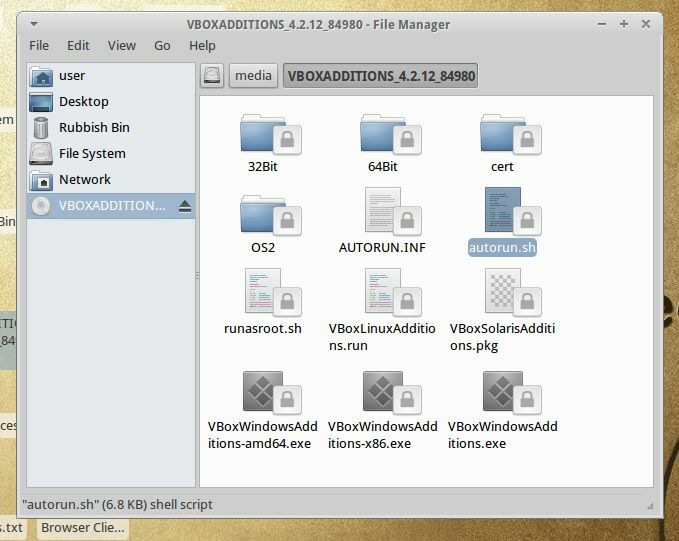 In the wizard, select the installation folder. Those of you that are familiar with BEAM will find that SeaDAS 7.0 is quite similar. After all these steps, you have the version of SeaDAS that you would have if you were working on Windows. Because we want a little more than that, we need to install some other components. 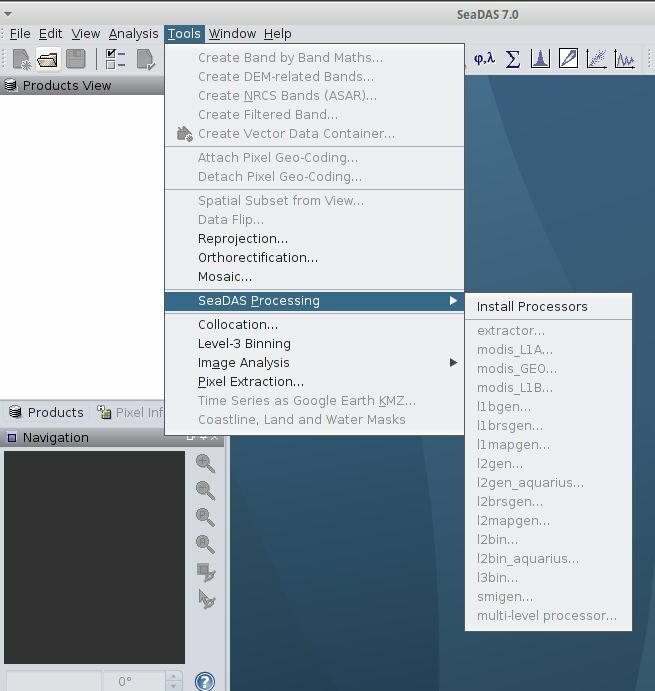 To install the processors, from the menu, select 'Tools', then select 'SeaDAS Processing' and finally 'Install Processors'. You must install SeaWiFS before any other even if you are not planning on using it. This is a known bug of SeaDAS. Fig. 11. Installing the processors. The first I am installing is the SeaWiFS processor. Check it and click 'Run'. It should take a while to download the necessary components and installing them. Fig. 12. Selecting the processor to install. A progress window will give you some information about the status of your installation. Fig. 13. The installation progress window. A message window will let you know when the installation completes. Notice that since you are using a virtual machine, everything takes a little longer than usual. Fig. 14. Installation of the processor completed successfully. You can now continue with the installation of the other processors. This is pretty much it. Although it takes some time, it is fairly simple. You may contact me if you have questions or comments/suggestions. IMPORTANT NOTICE: Before we finish, take a look at the size of your virtual machine. The default size of the OSGeo Live vmdk is 20 GB. As you will see, it may not be sufficient if you install all the processors and start working with imagery. I will post a method to increase the size of the virtual machine in a relatively easy way. If you 'google it', I am also sure you will find a few tutorials covering that and offering different solutions to this problem. Ocean Color Snippets was created to help and share information with fellow SeaDAS users working on computers running on Windows. Send us your feedback about our posts on SeaDAS and other remote sensing/GIS technologies. Thank you to FGreen for the nice background photo.